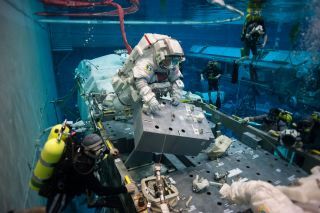 On May 10, 2013, NASA astronaut Terry Virts simulates extravehicular activity in the Johnson Space Center's Neutral Buoyancy Laboratory. His session, in which he was joined by European Space Agency astronaut Samantha Cristoforetti (out of frame), was to evaluate proper procedures and techniques in support of a possible weekend space walk by two astronauts on the International Space Station to trouble-shoot an ammonia leak issue, discovered earlier in the week. A number of SCUBA-equipped divers were in the water to assist the astronauts. Two NASA astronauts will venture outside the International Space Station on an emergency spacewalk today (May 11) in an attempt to fix an ammonia leak in the space station's vital cooling system. NASA's Chris Cassidy and Tom Marshburn will perform the unprecedented spacewalk. The spacewalk will start at 8:15 a.m. EDT (1115 GMT) with NASA TV coverage beginning at 7 a.m. EDT (1100 GMT). You can watch the spacewalk here on SPACE.com via NASA TV. "The plan for this EVA [spacewalk] really is to see if we can identify the leak," Mike Suffredini, NASA's International Space Station program manager said during a briefing yesterday. "The plan is to change out the pump on this particular EVA. The most likely sources of the leak is this particular pump." The space station crew is in no danger, NASA officials said, but the pump responsible for the movement of ammonia through that part of the system was shut off in order to conserve coolant. For today's spacewalk, Cassidy and Marshburn plan to inspect, and potentially replace, an ammonia coolant pump controller box on the space station's Port 6 truss, a segment of the station's scaffolding-like backbone that is on the far left side. NASA space station engineers suspect the box may be the source of the leak since the ammonia was spotted coming from an area near it on Thursday. This will not be the first time space station crewmembers have spacewalked to repair an ammonia leak on the space station's cooling sytem. NASA's Sunita Williams and Japanese spaceflyer Akihiko Hoshide took a spacewalk to correct a leak in a coolant loop on the International Space Station's Port 6 truss (its scaffolding-like backbone). The 2012 coolant leak was in the same loop as the current leak, but engineers don't yet know if the two leaks are related. The station's Port 6 truss is the oldest piece of the space station's backbone and carries two of the outpost's eight wing-like solar arrays. It was launched in November 2000 and originally installed on the station's roof, extending up. In 2007, visiting shuttle astronauts relocated the P6 truss to its final location on the station's far left side. Cassidy and Marshburn are experienced spacewalkers. They each performed three spacewalks — two of them together — during a 2009 space shuttle Endeavor mission. If the leak isn't fixed by switching out the pump, space station operations can still continue as planned. Marshburn, Canadian Space Agency astronaut Chris Hadfield and Russian cosmonaut Roman Romanenko are schedule to fly back to Earth two days after the spacewalk on May 13. NASA officials have said that the spaceflyer's departure will not be affected by the leak.